Purchasing refurbished electronics can be a crap shoot if you don’t do your homework on where the device came from and how it was “reconditioned.” Factory certified devices generally come with a 90-day warranty and, for the most part, I have had good luck with buying refurbed Chromebooks from reputable sources. Still, it’s a used device and outside of the 90 days, you are on your own if something should go south with your machine. One company that stands out in the recertified market is Acer. With an official recertified store, you can be sure the device you are buying has been handled and prepared by the same hands that created the Chromebooks, to begin with. Now Acer is going a step further and offering peace of mind for your purchase with extended warranties that guarantee to keep you up and running even if you damage your device accidentally. 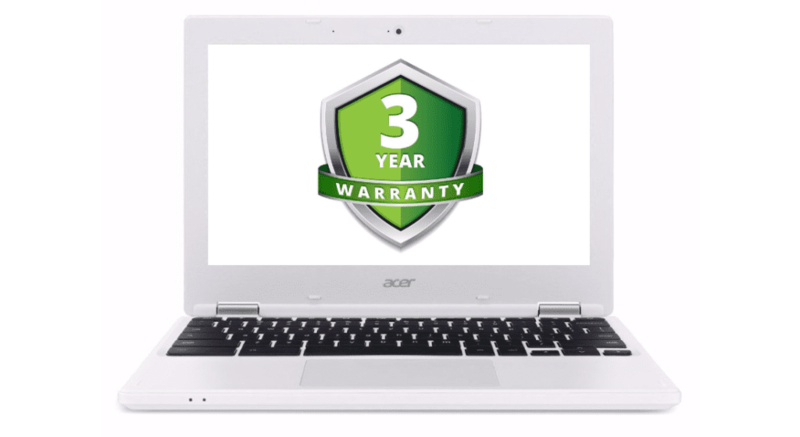 Apart from the 90-day factory warranty, Acer is offering additional coverage for two or three years, with or without a deductible and the warranty includes protection for accidental drops, spills and even power surges not covered by the manufacturer warranty. Here are some of the available options for adding coverage to your “new-to-you” recertified Chromebook. These examples are for devices priced between $200 and $299.99. You might be thinking the same thing I thought. “Is it worth the extra money?” Well, let’s do some math. A brand new Acer Chromebook 14 in Luxury Gold costs $299.99 and comes with a 1-year factory warranty that covers any defects of breakage that can be traced back to faulty parts or production. This does not include accidental damage on your part. The same Gold Acer 14 from the recertified store will run you $205.99 right now. Say you go for the 2-year, no deductible option. That brings your total cost to $321.98. A tad more than a new one but it gets you an extra year of warranty and the comfort of know that when you know a cup of coffee onto your keyboard, Acer’s got you covered. For me, personally, this is a huge bonus and I can assure you that if I purchase another Acer anytime in the near future, this will be the route I take. Chromebooks aren’t the only products Acer is covering. You can get up to 4 years of extended warranty on refurbished monitors. If you like to squeeze every penny out of your computing products, this is definitely the way to go. Find out more at Acer Recertified.